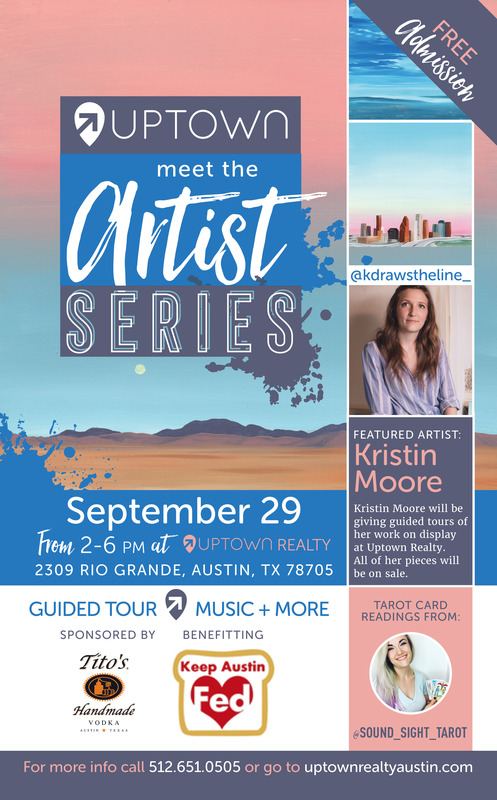 Uptown Realty presents the Meet the Artist Series featuring the incredible work of Kristin Moore Art + Design Saturday September 29th from 2-6pm. Let Kristin take you on a journey through her work and what inspires her while enjoying cocktails from Tito’s Handmade Vodka. Find out what your future holds with tarot card readings from Sound Sight Tarot and dance with us all day to great tunes all for a good cause to support Keep Austin Fed! As always, the party is free to everyone but donations will be accepted for Keep Austin Fed and all work is on sale with 100% of the proceeds going directly to the artist. Come support local art and party with us!